When I started thinking about my favorite reads in the last few years, I was shocked to realize just how many of them were fantasy. One of my absolute favorite moments in Pride and Prejudice is when Elizabeth asks Darcy when he began to fall in love with her, and he replies, "I was in the middle before I knew that I had begun." That perfectly describes my relationship with fantasy! 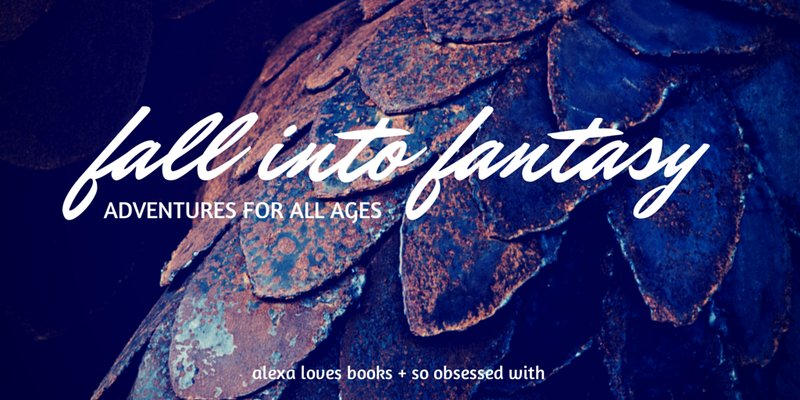 I had fallen head over heels for fantasy before I even realize that I liked the genre. What changed my mind? I've realized that my heart belongs to character-driven books, and I've found so many fantasy books with complex and well-developed characters at their heart. Where I was once afraid of the world building, I now eagerly anticipate immersing myself in a new and unfamiliar place. I love that the conflict is often on a much grander scale - it's often a matter of life or death and a battle of good versus evil. There are so many adventures awaiting me in the pages of a fantasy novel! The incredible blend of characters + setting + plot is what first captures my attention, and it's the addition of otherworldly magic and enchanting writing that reminds me why I'm so glad I gave this genre a shot. I didn't immediately think of this book when I was trying to remember my earliest fantasy read. I scoured lists of classic and popular children's fantasy books... just hoping to find something that rang a bell. When I spotted The Lost Princess on one of the lists, I couldn't believe I'd forgotten about this gem! My third-grade teacher read this aloud to our class, and I was in love. This is the story of two spoiled girls who learn valuable lessons and grow in character when they're taught by a Wise Woman. I was enchanted by the story! From the gorgeous illustrations to the entertaining story, I've pulled my copy of this classic off my shelf for a long overdue re-read. One of my favorite books growing up was Running Out of Time, which is also by Margaret Peterson Haddix. My obsession with that book is what originally led me to Just Ella. I loved this retelling of Cinderella where there's no magic - Ella must take charge of her own life and make things happen. Who wouldn't love a version of the fairy tale where Ella has more agency? I was hooked on this story, and it's one of the few books from my childhood that I managed to keep over the years. I was a major book purger growing up, but this one always had a special place on my bookcase. Reflecting on my love for this book reminded me that fairy tales (and their retellings) really were my first introduction to fantasy. I think that I read The Lion, the Witch and the Wardrobe prior to 2005, but I'm not positive. I am pretty sure, however, that I read it in 2005 because that's when the movie came out. Whether I read it in anticipation of the movie or re-read it to prepare for the movie, this is the memory I have of reading it. I loved the allegorical elements and the idea that anyone could one a door and step from real life into a magical land. I always intended to read the rest of the series, but I still haven't done it. I need to though. My husband, who isn't a big reader, was reading this series when we met. It's one of his favorites! Yes, you read that correctly. I didn't read the first Harry Potter book until 2011... and by that time, I'd already watched all the movies. Blasphemy, I know! I was convinced that I would hate these books, but I finally decided I might as well just try one. When I finally did, it became a turning point in my history with fantasy. 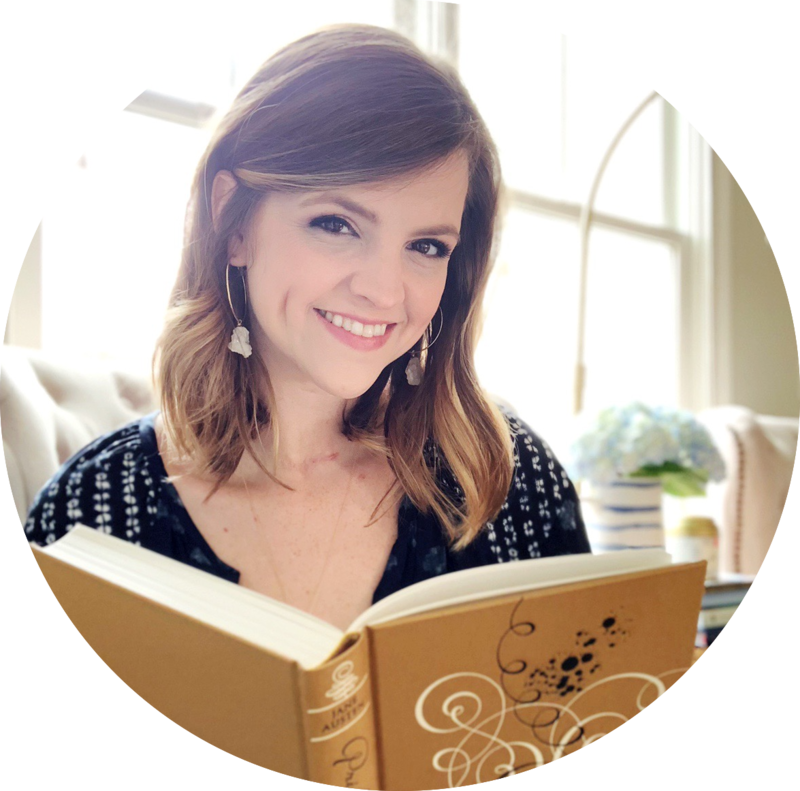 I was reading them right around the time that I created my blog, and it became a milestone moment for me. I'll never forget reading them for the first time! I'm so glad the magic was still there - even though I first experienced them as an adult and missed out on reading them during the height of their popularity. It was my love for this series that prompted me to try more fantasy. And the rest, as they say, is history. I read a lot of really amazing fantasy in 2012 and 2013, so it was difficult to think of a book that represented a milestone moment for me. But once I remembered Daughter of Smoke and Bone, I knew I had to give it to that book. I have a number of bookish firsts associated with this series. This was the first time a fantasy book made my Christmas list! It was also the first time I decided to buy an international edition of a book, the first time I listened to an entire series on audiobook (one re-read, two first reads) and the first time I ended up with the book in four formats (Kindle, audio, and two different hardcovers). 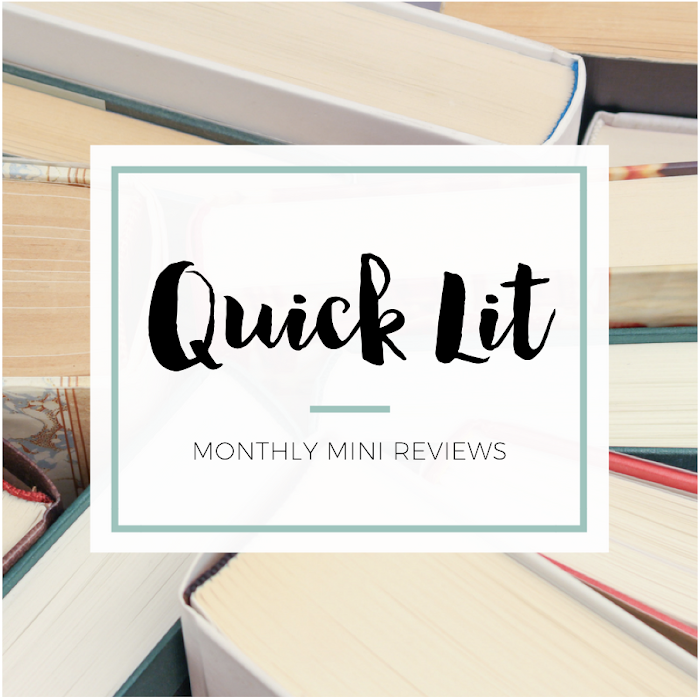 So, I almost put Throne of Glass on my list because it's the first book in the series (and I truly loved it). But I debated whether or not it was a milestone. The more I thought about it, the more I realized I had to use Heir of Fire as my most recent fantasy milestone. This was the book that made me stop, reflect on my reading choices the last few years and finally admit: I LOVE FANTASY. In my review, I compared this series to Harry Potter - both for the shift in tone reminiscent of Goblet of Fire and for the fact that the Throne of Glass series might be the closest I come to re-creating the Harry Potter reading experience. The anticipation for the next book, the love for the characters, the discussions I could have with other fans... I have epic levels of love for this series (and this book in particular). Why? I've said it before, and I'll say it again: There is a land called Perfection, and Sarah J. Maas is its Queen. Have you read any of these books? Any you want to read? 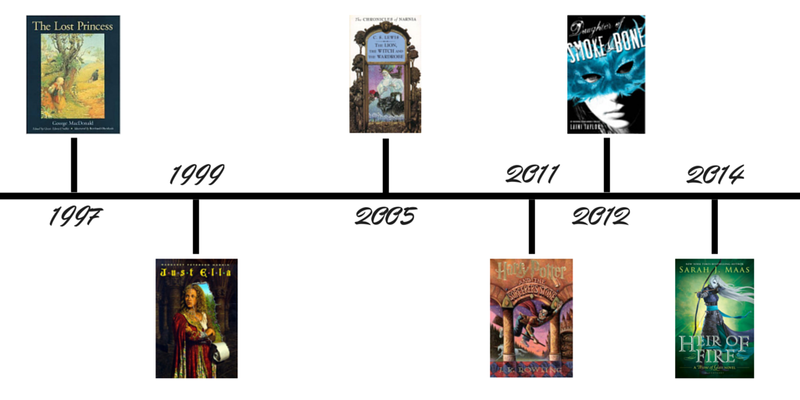 What books have been milestones in your history with fantasy? The Daughter of Smoke and Bone books are so beautiful. I adored that whole series. I started the fantasy genre with Narnia and Harry Potter, but it is one of my favorites. George Macdonald is such a classic, and I don't hear that many people talk about him. Have you ever read The Princess and the Goblin? It's great, too. I also read and LOVED Just Ella. I don't remember it too well but I DO remember that I loved it. C.S. Lewis, J.K. Rowling, and Sarah J. Maas are some of my all-time favourites EVER. I haven't tried Laini Taylor yet though and reading how much you enjoyed it has bumped it up my TBR list.